I got tired of trying to remember exactly what to include in every blog post. So I finally made up a checklist with all my little shortcuts in it. I thought this was just me. Until in EBA, multiple members starting asking for a checklist. And when I shared it, I got lots of positive feedback. Since I started the “Blogging Resources” section of my website, I decided to share this with you! My version is in my completely over-organized OneNote that has tons of tabs, pages, and sections. 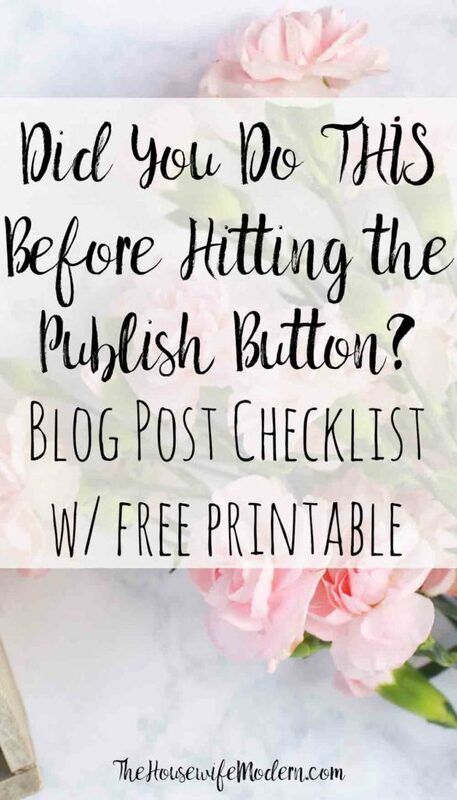 But I made up a free printable blog post checklist in case that would be easier for you. I honestly suggest just bookmarking this since it includes links that I didn’t include in the printable checklists. Yes, this post is long. And it might seem like overkill the first few times. But after you get it down, it won’t take as long as you think. There is a reason for every single item on this checklist. EVERY SINGLE PIECE of your content and strategy need to be excellent for it stand out among the millions of blog posts published every single day. The reason it is so long is because I wanted to give a thorough explanation of each item on the checklist. My days of thinking “writing a blog post” consisted of writing a little bit, slapping up a photo, hitting publish, and that was it are over. I’ve learned that while, yes, that does get a blog post technically published, it’s not going to get traffic. And unless you’re a great off-the-cuff writer, it’s not providing great quality to your readers. It might seem weird that this is before writing the post. Or at least starting the post. After all, you have a topic. But before you write 1,000 words and then have to go back and work in keywords, start smart. Figure out your keywords first and then work them in naturally. If you’re lost on keywords, ask yourself “what problem are you solving”- it can be how to make a certain recipe to how to get stains off walls to what to wear to the beach. Start there and then narrow your keywords down. For example, with this post, it actually started out as “things to do before you hit the publish button”. That keyword phrase is ridiculously long. 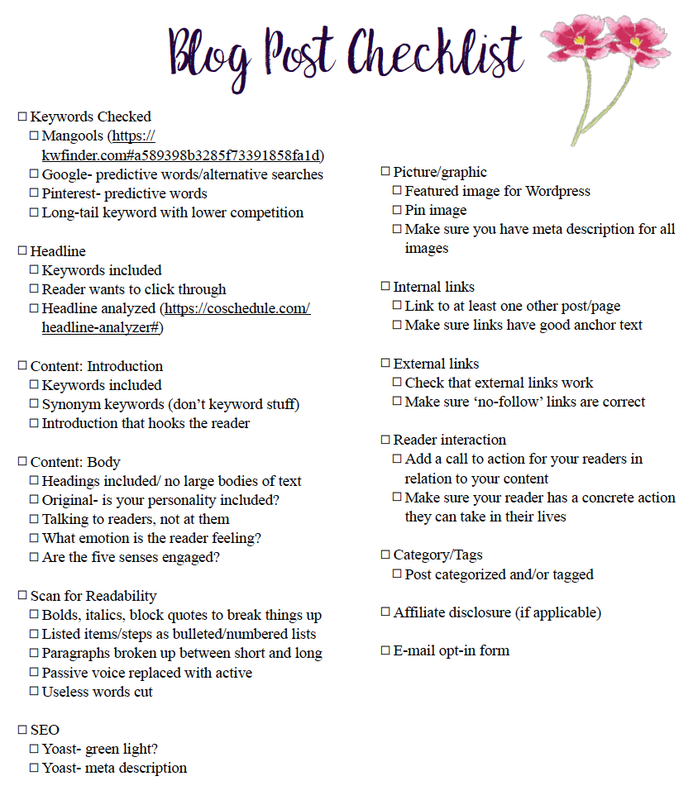 It took a little searching before I found “Blog Post Checklist” as what people would be searching for. My number one tool for SEO optimization and keyword searches is Mangools Keyword Search. 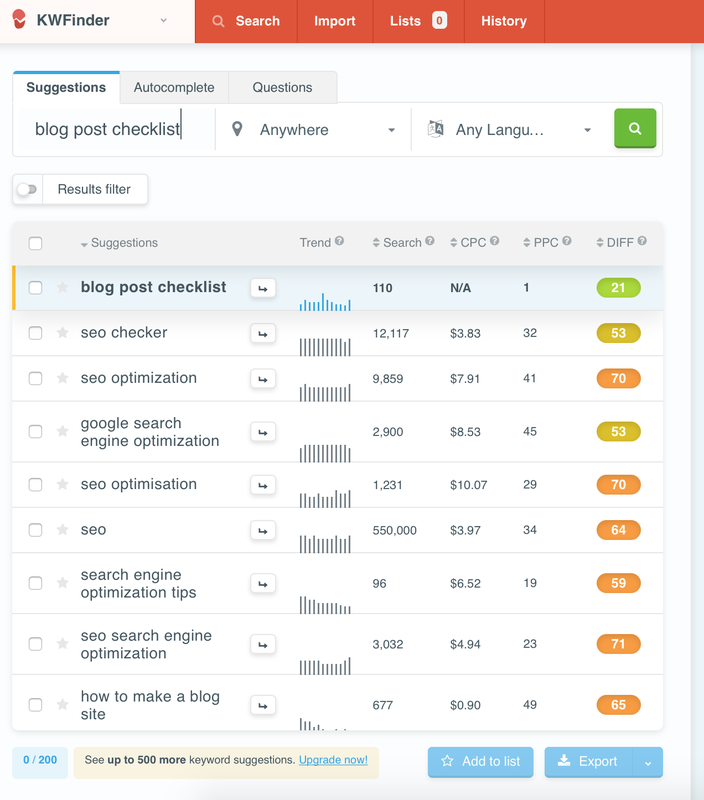 You can do five free searches a day (at least of now). I use the paid service because I find it worth it. Not only does it it tell you the search volume and pay-per-click, but it also shows the difficulty of breaking into that keyword. The difficulty will also be green, yellow, or red. Green means you can probably break in, yellow maybe, and red means you have to have major clout to start getting traffic for that keyword. The image below shows my search in Mangools for this post. You can see my search for ‘Blog post checklist.’ The difficulty level is ideal for me, even though the search volume is low. Search volume is irrelevant to me since I’m already dedicated to writing this post. Look at the search terms related to my search, though. This is key. While ‘SEO checker’ doesn’t relate to my topic, I see ‘SEO optimization‘. Since part of the post (in fact, this part about keywords) is related to that, I’ll make an effort to work it into the flow of the post. Your other option: While Google Adwords Keyword Planner (it might work better to copy and paste: https://adwords.google.com/ko/KeywordPlanner/Home) works, there are a few problems with it. First, you might have to copy and paste again after you sign-in. It keeps looping it back to their new screen which requires you to set up a campaign and doesn’t the have “Keyword Planner” feature. I can’t guarantee how long Google will continue to support this older option. It’s also a bit of a pain to use. Click on “Search for new keywords”. Ignore the other options. Type in your term in the “your product or service” box (again, ignore all the other options), then click the “Get ideas” button. Your search results will pop up. Note that the search volume is fairly vague and this doesn’t provide a lot of information. But you can at least get an idea of keywords related to your blog post idea. Mangools Keyword search shows the difficulty along with search volume and PPC. 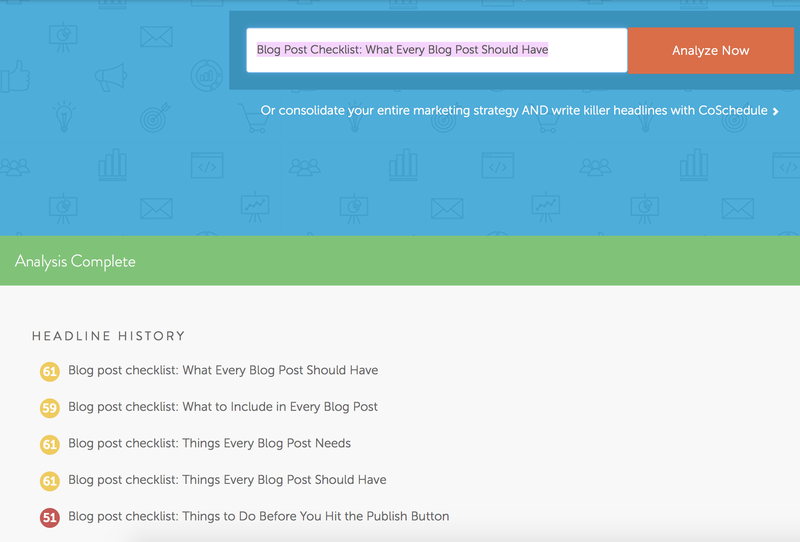 For example, for this post I did a search for blog post checklist. I ended up using the term ‘what every blog post should have’ as part of the title. I was originally going to do a numbered list…but I might update this in the future and would have to change it. Plus, people aren’t going to search for a specific number. A final way to check or refine your keyword is to use Pinterest. Go to Pinterest, and start typing in the search box. As you type, it will auto-populate more searches related to the ones you are doing. This might provide you with additional terms. 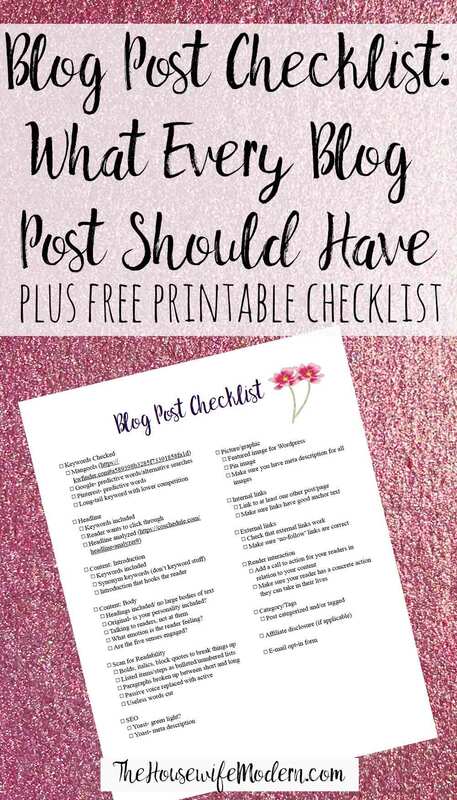 For example, I didn’t even think of doing a blog post checklist printable until I saw the Pinterest search! And decided that would be a great addition to the post. Google will include a "searches related to" on most searches. Check this for similar search terms you can work into your post. Type in your keyword in Pinterest search bar. It will auto-populate more terms below. You have your keywords. You have a couple of other related terms scribbled down to work into your post. I bet you thought you were going to write the post now. Nope, let’s get the headline done. Our title is going to have a few key features we want nailed down. And we want them decided now before we write so we can make sure they’re included in our post. Fairly obvious, but your headline needs to include your major keyword(s). Ideally at the beginning. 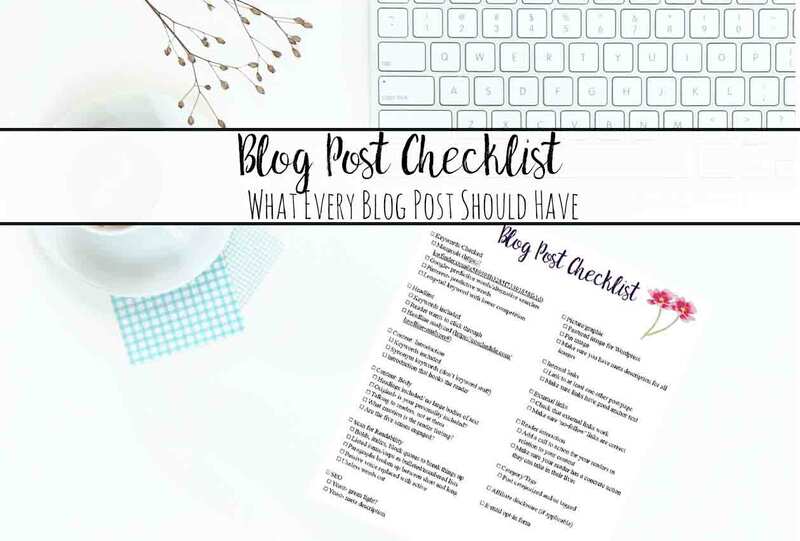 In the case of this post, it was easy to make Blog Post Checklist the first part of the title. The second thing to work into your headline is something the reader wants to click on. This one is a little more challenging, at least for me. The ideal title for this post would be something like “Are you doing these things before you hit the publish button?”. But it doesn’t include keywords. So a little searching netted me the phrase “What Every Blog Post Have.” It doesn’t have quite the punch, but still kind of makes you want to click through to see if you have those things in your blog posts. Recipes are the most challenging. After all, while Reese’s Muddy Buddies are delicious…there’s not really a headline that makes the reader HAVE to click through. If your topic doesn’t lend naturally to fulfilling this second requirement, just do the best you can. One great tool I’ve discovered is CoSchedule’s Headline Analyzer. It’s free to use. The image below is a few titles I put in before deciding on a title for this post. As you can see, my initial title choice wasn’t a hit. Please note that it is very rare that I get the magic green. I’m almost always yellow. But as I said, recipes are hard to make alluring. 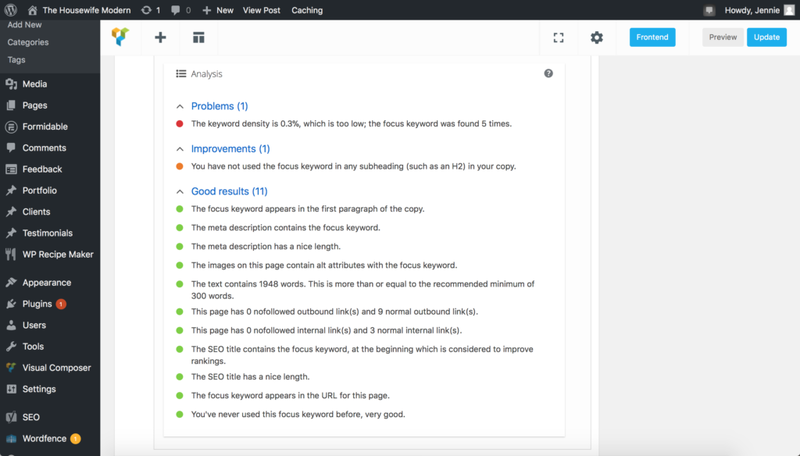 Headline Analyzer will give you a score of various headlines you input. The breakdown on how you got the score is also included on the site. You have your keywords, you have a great title. Now we’re ready to start writing. I suggest an outline to help the flow. Plus, if you get stuck, you can always hop to the next section. Fairly obvious, but your introduction needs to include your major keyword(s). If you did your keyword work correctly, you naturally ran across various synonym keywords and phrases related to your actual keyword. Work these in naturally…but don’t keyword stuff. If you’re writing a high quality post, the opportunity to use your keywords will come up naturally. A great introduction will grab the reader and hook them in. When I’m slogging through yet another introduction and trying to figure out how to be witty and interesting, I hop on over to “10 Ways to Write an Irresistible Headline.” Fresh, outside ideas usually helps get my brain percolating. I mentioned making an outline above, but if you didn’t, you still need to have sections unless it’s a very short post. People are turned off by large blocks of text. Even if you break it up into paragraphs, they’re going to scan first to see if they want to read it. Headings allow them to get an idea of what the content is. • Original- is your personality included? Be original and inspiring! Let personality shine through- I’m sarcastic (in a nice way, not a mean way). It’s hard to write sarcasm. It just doesn’t translate well to text. People end up taking it literally. So I make an effort to translate what would be sarcasm into jokes (and include haha in parenthesis to make it obvious). It’s odd, you don’t see it on a lot of sites. But that’s my personality. And everyone is just stuck with it. 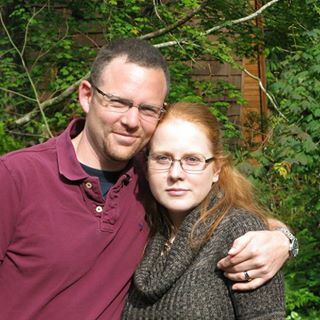 Especially my poor husband (haha). Use a story, a question, or a thought process to draw in your readers. Talk to them, not ‘at’ them. I learned during a course I’m taking that talking to one person- my “ideal reader” is the key to great content. Right now I’m not writing to masses of people, worried about how 100 different people might apply this to their blogs. I’m talking directly to YOU. And how this advice will help you connect with your readers. • What emotion is the reader feeling? As you write, what emotion is your reader feeling? What is the tone you are trying to get across in your writing. You’re not just putting information out there, you’re trying to solve a problem or fill a need in their life. • Are the five senses engaged? If it works with the post, engage the senses. With recipes, I talk about how the house smells of pumpkin pie. Or how warm I am curled up with creamy macaroni and cheese during a rainy day with the light is low. Along with doing the following, you might want to run your text through the Hemingway Editor. This is an amazing (and free) editor that lets you know what you need to improve! I just found it and love it. Cut words such as “actually, basically, in order to, just, kind of, literally, quite, really, sort of, that, type of, very”. I have a serious problem with over-using the word serious. See? If this weren’t an example, I would cut that word. If you’re not using Yoast, please start. It’s completely amazing. With Yoast, you put in your keyword. 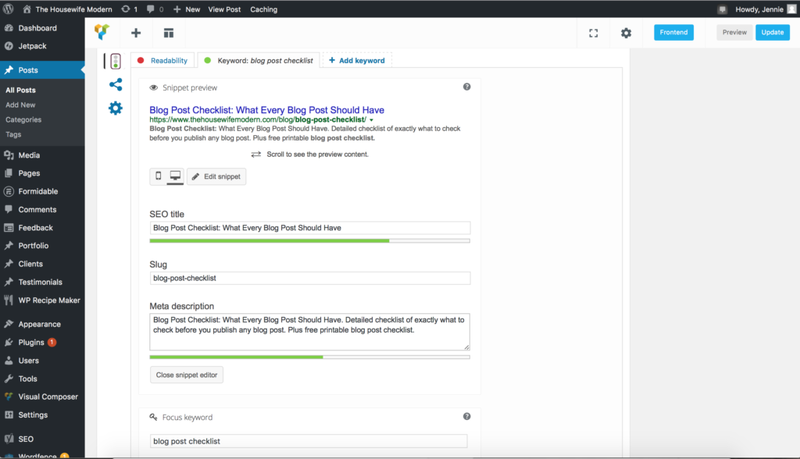 Yoast then analyzes your post (title, meta description, url, and content) to see how it scores on search engine optimization. You’ll get either a red, yellow, or green light. You’re aiming for green. The image below shows how it is very specific on what you need to improve as well as what is correct. Yoast will tell you what is good and what needs improved in relation to SEO. Make sure your meta description is filled in. The meta description should include your keyword(s). This is what will populate on a Google search. This is also the description I use in the alt-text box that will populate on Pinterest (see images section below for more on this topic). With Yoast, you can specify the meta description that populates on Google as well as get SEO analysis by inputting your keyword(s). All I do is make a duplicate of my template (so the original is still there), add the images, change the text, and save. Done! If you’re doing a non-recipe post and having trouble finding images, I did a post “Where to Find Images: 75+ Best Places for Free Photos“. Make sure you have your featured image set for WordPress. Most themes and plug-ins will pull this image for the “related posts” option as well as other things. Make sure you have a pin image! Pin images are so important, I did an entire post on them “8 Ways to Create the Perfect Pin Image.” Quick and dirty, though: vertical images, bright, makes the reader want to click through. Remember that meta description we did? This is perfect for your Pinterest snippet. Now, I’m going to be blunt. According to the new “rules,” you’re supposed to be using the alt-text box for descriptions such as “Salmon on a blue plate with wild rice on the side.”. However, this box is where Pinterest pulls its description from. So, unless you’re going to shell out money for the paid plug-in that allows for separate pin and alt-text image descriptions (or are going to code it for every image on your site), you’re going to use the alt-text field for your meta/Pinterest description. When the image is pulled up, you can edit the caption, alt-text, and description. In this case, you're reading the caption. The alt-text and description are the meta description I want Pinterest to pull. If you’re not sure what to link to, do a Google search of your site. Type: “site:YOURSITEURL KEYWORD” into the search box. Find a related post to link to. For example, I was doing a roast chicken recipe, but couldn’t really think of anything to link to. So I typed “site:thehousewifemodern.com chicken” into the google search bar. Up popped up everything on my site related to chicken. And I remembered I can use the leftovers from the Roast Chicken in Chicken Pot Pie. The tie in worked perfectly. In recipes, it’s pretty obvious the anchor text (the text the reader is reading that leads to a link) is going to be the recipe name. However, other times you might not want to put the name of the post. 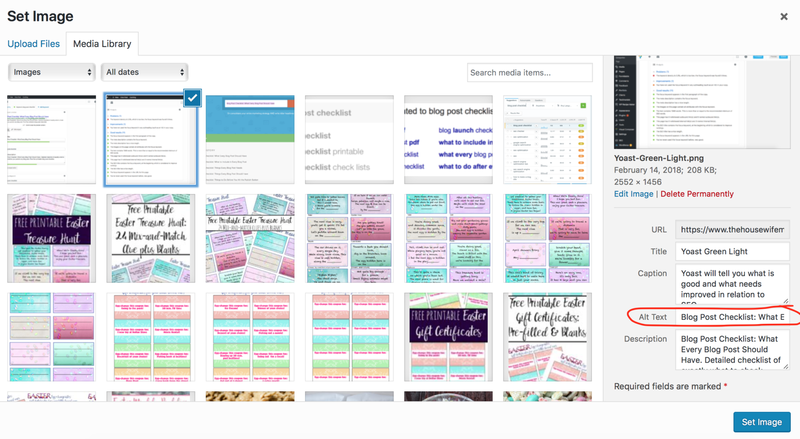 Example: say I’m writing a post on Pinterest in general. In one small section, I mention ideal Pinterest image size. I did an entire post on ways to make a great pin image, and it included stuff on ideal image size. I’m going to use “ideal Pinterest image size” as the anchor text instead of the post title, which is “8 Ways to Create the Perfect Pin Image.” This not only makes it easier for the reader to understand why I want them to click over, but also gives the Google Gods another keyword to relate that post to. Good for SEO. It should go without saying that you don’t want to be linking your readers to low quality or spammy sites. But I’m going to throw it out there just in case. Add a call to action for your readers. If you want them to comment, ask them to comment. If you’re pitching a sponsored post, TELL THEM to click through and check out the amazing spaghetti sauce you’re talking about. In the case of this post, hey, you should re-pin this great post if you think it would help out someone else. Or share it on Facebook! People are more likely to act upon your post if you tell them what you want them to do and why. For example, in the red text above, I not only asked you to share this post, but told you why (it might help out a fellow blogger you know). Does your post leave the reader with some action to take in their lives? The best posts are providing a solution, solving a problem, etc. So look at your post: does it leave the reader with a concrete action they can take? In the case of this post, you can either bookmark it (which is stated at the top of the post), or print off the checklist and use it. The fact their is a printable to use makes it clear there is a concrete action to take. • If applicable, is affiliate disclosure in the post and in proper spot? To print, just click on the PDF file below and print from there. Or click on the image…it will open in a new window. You can either save to computer or print. But I suggest the PDF. Thank you so much for this wonderful kit! That’s a very comprehensive and helpful article. Thank you!